As depicted in Al Hirschfeld's famous caricature: Dorothy Parker at the Algonquin Round Table (lower left) surrounded by Robert Benchley, Alfred Lunt and Lynn Fontanne, Frank Crowninshield, Alexander Woollcott, Heywood Broun, Marc Connelly, Frank Case, Franklin P. Adams, Edna Ferber, George S. Kaufman and Robert E. Sherwood. "Why is it that your poems don't rhyme?" the dagger in my heart. What was it that Ms. Parker wrote? A ballad of great weariness. My thoughts say I am elsewhere. "Go home. Change the locks." Would you love me should I rhyme like Dottie P? Born this day in 1893, Dorothy Parker was a poet and critic known primarily for her wit. She is remembered as one of the founders of the fabled Algonquin Round Table literary group. One of her better known quips is, "Men don't make passes at girls who wear glasses." So, she never wore hers in public! 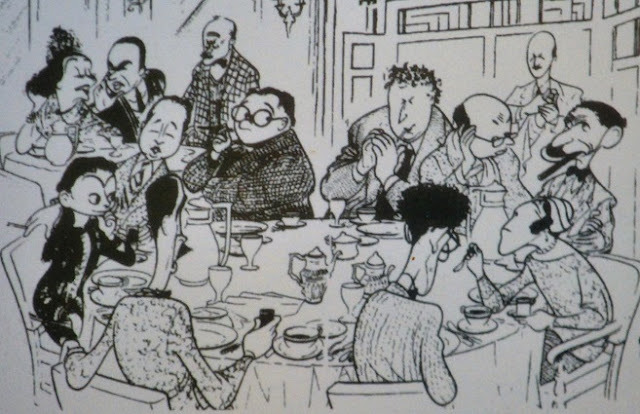 While this poem is a flight of fancy, the author did pick up a postcard at the Algonquin Hotel of Al Hirschfeld's famous caricature. It sits framed in the author's home in California.